[description_short] => SPECIAL PAYMENT BASED ON ALGAE EXTRACT ENRICHED WITH BORO, COPPER, IRON, MANGANESO AND ZINC. Concentrated solution to 33% of algae extract Ascophyllum nodosum obtained from a cold extraction method enriched with Boron, Copper, Iron, Manganese and Zinc in order to maintain the activity of it's molecules. [characteristics] => AQUA MAR GREEN FRUIT is a product based on algae extract of the species Ascophyllum nodosum obtained through an exclusive process of fresh preparation that includes: manual harvesting, cleaning and a new cold extraction system followed by a low temperature concentration process, resulting in a liquid extract, completely soluble. The delicate treatment applied to fresh algae can release and retain all the bioactive nutrients of macroalgae, guarantee their bioavailability and maintain the activity of their molecules. AQUA MAR GREEN FRUIT is a 33% concentrated solution of natural algae extract (Ascophyllum nodosum). The extracts of Ascophyllum nodosum are rich in cytokinins, auxins, gibberalins, betaines, mannitol, organic acids, polysaccharides and amino acids. These phyto-regulatory molecules are involved in the growth and mobilization of nutrients towards the vegetative organs. They also contain both macronutrients (N, P, K) and micronutrients (Mn, Cu, B, Zn). [application] => It's use is recommended to stimulate the general metabolism of the plant. The application of AQUA MAR GREEN FRUIT to the crops promotes germination of the seeds, improves the growth of the roots, increases the degree of fruit ripening, delays it's senescence and increases the resistance to fungal and bacterial diseases. Vegetable Eco-activator based on marine algae extracts, enriched with Boron, Copper, Iron, Manganese and Zinc, whose contents in nutrients and hormones provide excellent results, both in foliar application and in the soil. It's balanced content in natural cytokinins stimulates the flowering, curdling and ripening processes. SPECIAL PAYMENT BASED ON ALGAE EXTRACT ENRICHED WITH BORO, COPPER, IRON, MANGANESO AND ZINC. Concentrated solution to 33% of algae extract Ascophyllum nodosum obtained from a cold extraction method enriched with Boron, Copper, Iron, Manganese and Zinc in order to maintain the activity of it's molecules. AQUA MAR GREEN FRUIT is a product based on algae extract of the species Ascophyllum nodosum obtained through an exclusive process of fresh preparation that includes: manual harvesting, cleaning and a new cold extraction system followed by a low temperature concentration process, resulting in a liquid extract, completely soluble. It's use is recommended to stimulate the general metabolism of the plant. The application of AQUA MAR GREEN FRUIT to the crops promotes germination of the seeds, improves the growth of the roots, increases the degree of fruit ripening, delays it's senescence and increases the resistance to fungal and bacterial diseases. 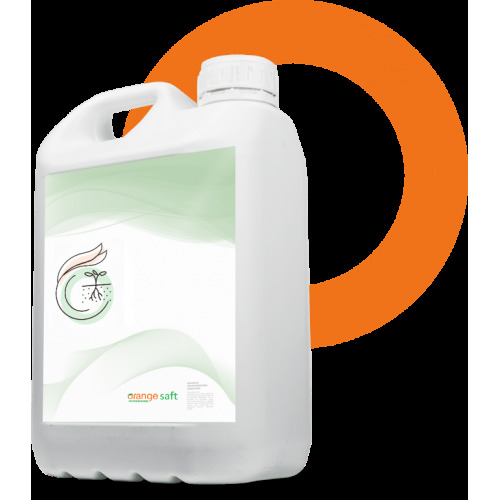 Vegetable Eco-activator based on marine algae extracts, enriched with Boron, Copper, Iron, Manganese and Zinc, whose contents in nutrients and hormones provide excellent results, both in foliar application and in the soil. It's balanced content in natural cytokinins stimulates the flowering, curdling and ripening processes.